I’d like to take this opportunity to wish everyone a Merry Christmas and to share with them my computer-generated Christmas card. The model contains over 27,000 objects. 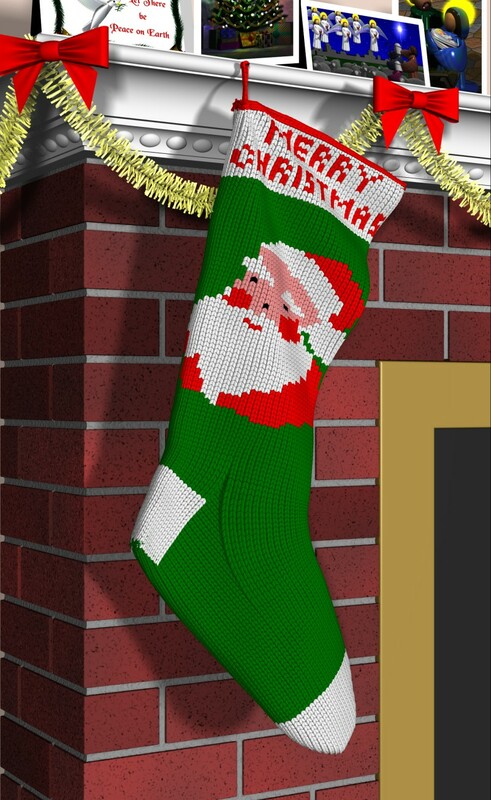 There are 6169 stitches in the stocking each of which is made of four individual pieces. There would have been more stitches but the back side of the stocking was not modeled. There are 2424 pieces of tinsel in the garland. The cards on the mantle are my card designs from 2001, 2002, 2004 and 2006. It took about 50 hours to design, test render and re-design. Most of that time was figuring out the mathematical formulas to position each individual stitch and to add wrinkles to the entire stocking. The final image was rendered at 1425 x 2325 (300 dpi) resolution. It took 2 hours 31 minutes to render on a 3.2 ghz Pentium 4HT computer running Windows XP Home Edition. ©2007 Chris Young, All rights reserved.